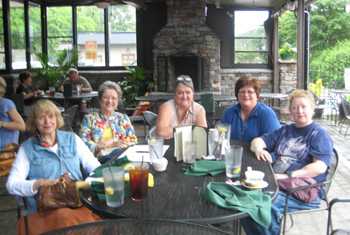 Today 5 of us met for lunch today, out of the 23 people on our contact list. There were quite a few conflicts and a last minute sickness, but we had a totally enjoyable visit at the James Joyce Pub near Jimmie Moomaw's home in Avondale Estates. We agreed to affiliate as an informal chapter, so our agreement will be forthcoming. Also two people took membership forms and indicated their complete support for our association. The most important piece of business was our brainstorming for a name, and the eventual choice was "Atlanta's Mag Chain". Mary Helen Harris mentioned that if others choose to adopt similar names for their city, we could become "links" in the chain that binds us to the W and each other.